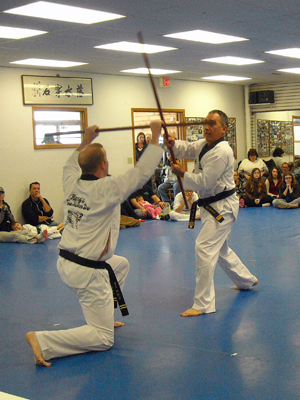 Originally people studied the Martial Arts for Self-Defense and Life Preservation. They sometimes had to study in secret, since many rulers had made the study illegal. 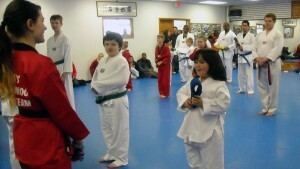 Today, some of our students train at Hong’s Tae Kwon Do because of a need to know self-defense. Others train because they want to fight in tournaments. Some seek an exercise program that is not too boring. Some just want to have fun and meet new friends. Whatever your reasons for wanting to learn the Martial Arts, you will find others at Hong’s Tae Kwon Do with the same interests, desires and goals. That is why Hong’s Tae Kwon Do has developed teaching methods that will not only help you learn the art of self-defense quickly and easily but also provide a wide range of benefits for students of all ages. So whatever your reasons, whatever your goals, Hong’s Tae Kwon Do can help you get in the best physical and mental shape of life.